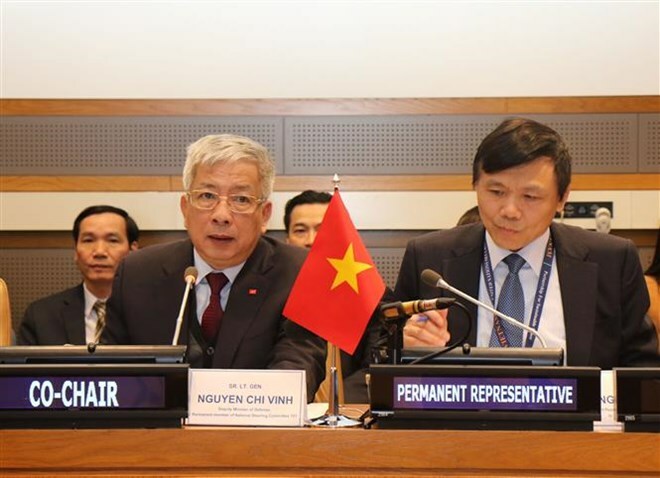 New York (VNA) – Vietnam wants the international community to join efforts in dealing with war consequences, helping the country develop sustainably and participate in UN peacekeeping operations more actively. In his remarks, Deputy Minister of National Defence Sen. Lieut. Gen. Nguyen Chi Vinh thanked international friends, especially the UNDP, for helping Vietnam overcome war consequences over the years. Vietnam is a symbol for efforts to move on from war to step into a new development period, and a symbol of international cooperation, including countries which made war in Vietnam, he said. Vinh attributed the results to the Vietnamese Government’s endeavours to make Vietnam recognised as a country of peace and safety. However, the officer said, there remain difficulties ahead, and further support from the international community is crucial. Asako Okai, Assistant Secretary General of the UN, UNDP Deputy Director General and Director of the UNDP Crisis Bureau, acknowledged the challenges facing Vietnam in settling war consequences and maintaining sustainable development. These challenges may lie in climate change or global financial uncertainties that affect financial resources for war consequence settlement, she said. Given this, the UNDP plans to support Vietnam, especially through existing projects coordinated by the UNDP and funded by the Korea International Cooperation Agency (KOICA), aiming to cope with climate change and clear bombs and mines, she said. The UNDP has also deployed projects that support Vietnamese bomb and mine victims, she added. Caitlin Wiesen, a representative of UNDP Vietnam, spoke of cooperation between Vietnam and the US in war consequence settlement over the years. Other international delegates lauded Vietnam’s efforts in handling war aftermaths and participating in UN peacekeeping, as well as effective collaboration between Vietnam and the UNDP, foreign countries and international organisations in this regard. They said they were impressed by development in Vietnam, which has emerged from one of the world’s poorest countries to become a middle income earner in only 25 years and complete most of UN Millennium Development Goals at the national level before the 2015 deadline. Results in war consequence settlement in Vietnam have significantly contributed to the fulfillment of these goals, they said. They also committed to continuing their assistance to Vietnam to ease plight caused by the war, thus contributing to peace and sustainable development in the world. In an interview with Vietnam News Agency, Vinh said Vietnam is willing to share its experience and support with the international community in dealing with war aftermaths. Vietnam has sent military health workers and officers, and will dispatch sappers to UN peacekeeping missions in Africa, he said. War consequence settlement will be combined with issues regarding the environment, development and science so that each related project would benefit national development as well as international relations, he said. According to Office 701, although the war in Vietnam ended 44 years ago, its consequences have remained severe as a large amount of toxic chemicals used during the war are still affecting human health and the environment. In 2019, the office will continue to implement projects on dioxin remediation at Bien Hoa airport, and expects to treat 35 percent of the contaminated land and review all people who participated in the war and their children exposed to the chemicals by 2020. Statistics released by the Vietnam Association of Victims of Agent Orange (AO)/dioxin show that there are still more than 3 million Vietnamese people affected by AO/dioxin. During 1961-1971, some 80 million litres of herbicides were sprayed onto 2.63 million hectares of land in Southern Vietnam, 60 percent of which were AO/dioxin, the Ministry of National Defence said. It is estimated more than 2ha million of forest and some 20,000 villages were affected, with about 2.1-4.8 million people exposed to the deadly chemicals. Between 1964-1975, Vietnam suffered from more than 16 million tonnes of bombs and mines, four times more than those used during all of World War I. All 63 cities and provinces in the country are contaminated with unexploded ordinance, with total poisoned area amounting to some 6.1 million ha or 18.71 percent of national area.